As already mentioned, the tour as it is proposed here is mainly intended for e-mountain bikes, given the uphill gradients involved. This however does not at all mean that it is a tour for everyone, especially in the downhill stretch from Passo Rocchetta to Malga Palaer, where good steering technique is a must on several parts. 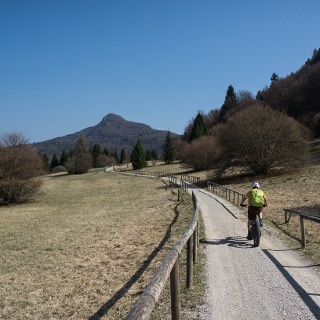 The panoramas which can be enjoyed are truly spectacular and, if you are riding a traditional mountain bike, you can consider taking an alternative ascent route. For example, the routes in Val di Ledro, which can also be found on this portal, include the tour “Bocca dei Fortini – Passo Guil”. The ascent is challenging here too, but more accessible without the help of a motor. In this case, once you reach Pre, follow directions for Lake Ledro. When you come to the lake, keep to the left and you will come to the starting point for the alternative ascent suggested. From the Guil Pass you can pick up directions for the 733. Should you decide to go to visit the panoramic viewing point Punta Larici, especially in the busiest period, bear in mind that it is extremely exposed and there is very little space to move. For this reason you are advised to leave your bike in the meadow nearby. The trail starts out on the lake front in Riva del Garda, in front of the Garda Trentino tourist information office. Take the cycle path which leads along Viale della Liberazione towards the centre of Riva. Pass the imposing structure of the Rocca and Piazza 3 Novembre, coming to the main road Gardesana Occidentale at the harbour. From here, follow the main road to the south for a few hundred metres. 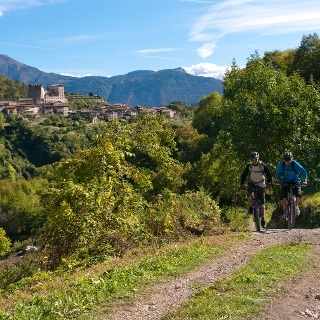 Before you reach the first tunnel on the Gardesana, keep to the right and take a steep cobbled ramp which leads to the start of the famous “Ponale” trail. This stretch of the route, on a dirt road, has spectacular views. Without any alternative trail suitable for a bike we come to the end of the dirt road at the Ponale Alto Belvedere snack bar. At the nearby junction, keep right in the direction of Lake Ledro. You come to the main road at the exit of the tunnel and follow it uphill for a few hundred metres, then turning left in the direction of Pregasina. Immediately after you cross the bridge, take the dirt road on your right. Following the clear signposting you soon come to Pre. The signposting tells you to take a sharp left, but before continuing on the ascent, you can fill up on water at the cool fountain at the entrance to the town. From here on, the going gets really tough: as far as Leano the gradient is around 20%, on a cemented or cobbled surface, and there is no let up. Once you come to the small village, keep to the main road which then becomes a dirt road leading in the direction of Passo Guil. Once you go over the pass, the worst is behind you. Keep to the left, always sticking to the main track until you come to Passo Rocchetta. There are some rather exposed stretches here but the track is always fairly wide and easy. The final few metres of ascent which take you the gap of Passo Rocchetta are steep and quite technical, even with the help of pedal assist, and require a certain amount of commitment and technique. Otherwise, you can always push the bike the short distance. Once you have passed the bar, there are two possible ways down to Malga Palaer. Follow directions and take the trail on the left, the other one is exclusively for hikers. This section is the most technical part of the trail, you will come across lots of roots, steps, rocks and some narrow bends. When you get to the forest road, keep to the right until you come to Malga Palaer. Signposting on this trail sends you downward on the forest road as far as Bocca Larici. 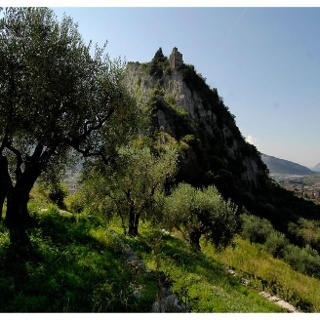 Here you are in one of the loveliest panoramic spots in all of Lake Garda: Punta Larici. The trail is still following the forest road, downhill as far as the town of Pregasina. Cross the centre where there are other places to stop off for refreshments, and then continue on downhill along the main road. On this downhill stretch of paved road there are a number of blind bends, the road is rather narrow, and apart from pedestrians and bikes, you might also come across some cars. Shortly after you pass the panoramic viewing point with the big statue of Regina Mundi near the start of the tunnel to Val di ledro, turn right and take the old road, now closed to traffic. This takes you straight back to the junction you came to at the start of the ascent near the snack bar. Follow your tracks back along the spectacular Vecchia Ponale trail to Riva and the point where you started from. Bei „Kondition“ sollten mindestens 4 bis 5 Punkte stehen. Daher die Abzüge bei der Bewertung. Auch technisch ist sie mindestens Mittel! Ohne eMotor eine echt harte Nuss. Ansonsten kommt man in Sachen Landschaft und Erlebnis voll auf seine Kosten. Tolle Strecke - muss nur angemessen bewertet werden. Die Tour ist definitiv nicht „leicht“. Bergauf ist einiges an Kondition nötig um die teilweise sehr steilen Passagen zu meistern. Zwischen Pre und dem Passo Guil sind mehrere hundert Höhenmeter aufgrund der Steilheit zu schieben. Bereits Elmar Moser und andere aktuelle Führer fahren diesen Abschnitt vermutlich deshalb nur abwärts und bezeichnen ihn als Rüttelpiste.